What started in January as a push for the Wild Card spot has suddenly shifted to the race for the division title. If the playoffs started today it would be Pens-Flyers and Caps-Devils in the first round. As you can see Carolina is just one win out of the final Wild Card position. The Penguins hold their divisional future in their own hands with 11 of the remaining 21 games coming against Metro teams, highlighted by two more meetings against both Philadelphia and New Jersey. Tonight the Penguins play their first of those 11 division games as they faceoff against the team that everyone had as their “sleeper” pick to make the playoffs. 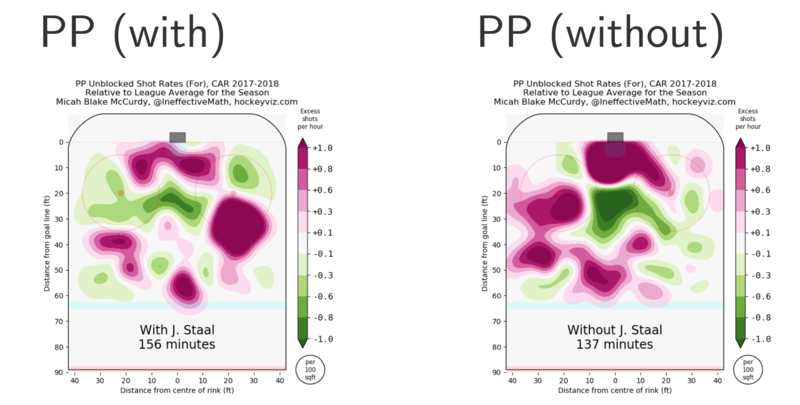 The Hurricanes started the year off strong only to hit a pothole or two in December and early January but have recently started to right their ship, though their 4-4-2 pace in their last 10 doesn’t suggest they have all wheels turning yet. 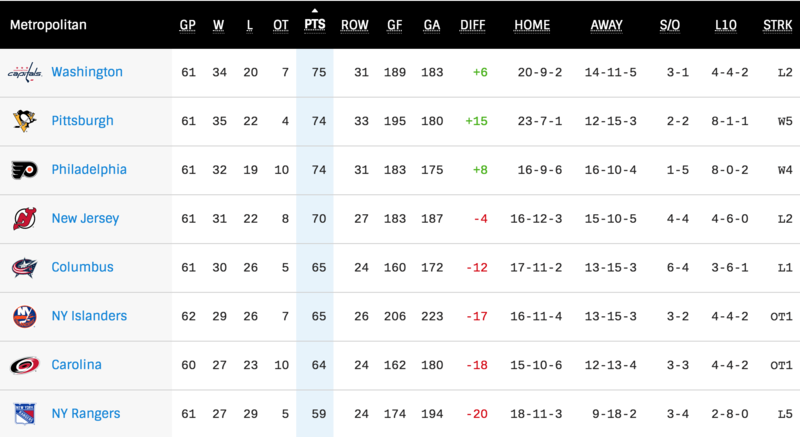 Carolina currently sits 7th in the Metro which sounds worse than it is considering they are only 1 point out of the final Wild Card spot in the East, yet another testament to how bad the bottom 5 Atlantic teams are. The Canes are using a bit of the Ottawa 2017 plan with 10 overtime losses aiding their points total on the season but hey, whatever works. It isn’t a hard decision if you are running the bench for the Hurricanes right now, if the team is serious about making a return to the playoffs this year they will be turning to the man that has been there with them before the rest of the way. The good news for the Hurricanes is they only have to pay Jordan $6 million dollars for the next 5 seasons. The better news is the Staal they traded away has 54 goals in 141 games for the Wild, Jordan on the other hand has 56 goals since the start of the 2014 season (263 games). The four-time 20 goal scorer for the Penguins has only hit that number once (20 goals 2015-16) with the Hurricanes and is yet to reach the 50 point mark with the Canes. Patric Hornqvist returned to practice yesterday and after initially starting with a no contact jersey he switched it out for a regular jersey. All signs seem to point to a Hornqvist return and with that Sullivan shuffled up the lines a little bit in practice yesterday. Conor Sheary has gone from “the winger for Sid” to rotating shifts with Ryan Reaves, but at least he tries hard. Sullivan isn’t one to just practice with lines for the heck of it so I decided to put the lines straight from practice into the graphic, I also took into consideration the fact that Ryan Reaves is never scratched when making my decision to leave Sheary off the lineup. I can’t wait for the first “Sheary being held out of lineup tonight” trade rumor to surface, you heard it here first. I found it interesting that Sullivan was willing to break up the Malkin line by moving Rust to the top but I understand the thinking behind it, Geno is playing out of his mind and Rust could be the boost that puts Sid there too. Regardless it will always be a good day in the neighborhood when Phil Kessel is just sitting on the third line waiting to tea bag the opponents. You can see by the Hurricanes line up that they are trying everything they can think of to generate a sustained 60 minute attack. This is highlighted by the placement of Jeff Skinner on the third line which has nothing to do with the forwards performance. Skinner is currently second on the team in goals with 20 as he trails a hoe named Aho by 1. Fun fact: Jeff Skinner’s last goal (his 20th of the season) was his 200th career NHL goal; Jordan Staal’s second to last goal (his 13th of the season) was his 200th career NHL goal. I feel bad for ripping on Jordan so much in this post, but maybe it will help bring some of you down to earth a little bit while you’re hoping GMJR makes that big splash for a stellar center. It’s the last Friday before the trade deadline and everyone is assuming the Penguins will make some kind of deal. Like most I am leaning towards them making moves similar to last year where they get some insurance players in case of injury but nothing major which isn’t a horrible plan considering major additions (see: Shattenkirk) rarely pan out and minor ones (see: Hainsey, Streit) do. If you to read one of the most thorough pieces on what each team should be doing at the trade deadline we have you covered here. Everything points to the Penguins making some trades this weekend and into Monday so tonight could be the last time you see certain players depending on how big the trade is. It is also important to remember two things during this trading season: first, don’t trust anyone without a blue checkmark even if they are “credentialed” Pittsburgh media and second, not every GM is going to be willing to help GMJR compete for a third in a row. 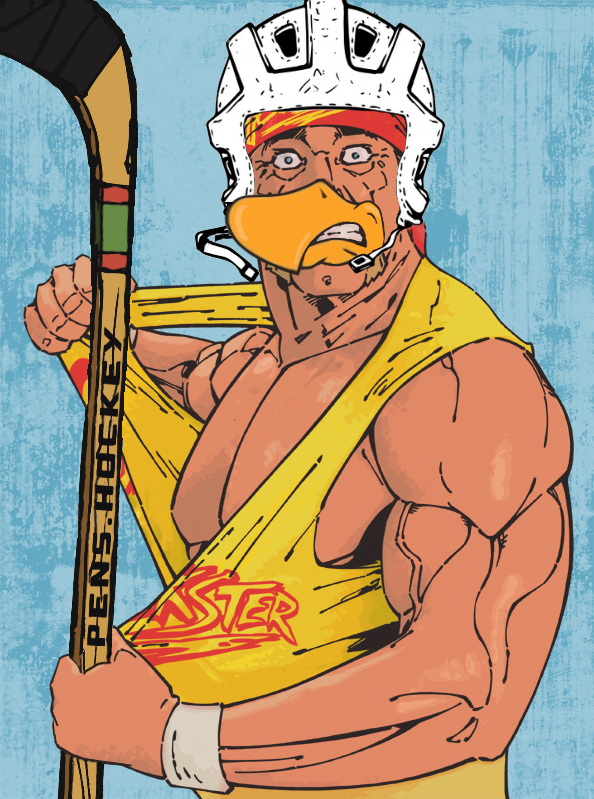 The Pens have won 5 in a row brother and the Hurricanes are hanging on by a thread. The boys could be on top of the Metro after this one, brother. There’s only one way to do it, brother. You got to go in there and get the W, brother. Now let’s go brother! This entry was posted in 17/18 - Gameday. Bookmark the permalink.